The bright Art Deco vibe that pulses through the lively cultural melting pot of Miami definitely dazzles. With sights and sounds that make this place constantly abuzz, it only makes sense that the foods here will put you on sensory overload too. Sure, you can find any cuisine imaginable in the stunning city of Miami, but you’d better take a bite out of the foods Miami is most well-known for first. If you’re visiting Miami between October and May, you simply must splurge on stone crabs. They aren’t cheap, but the sweet and succulent meat from these claws will forever be burned in your brain. They’re served chilled with a divine mustard sauce, though if you ask for drawn butter, you’ll be happily accommodated. If you’ve had key lime pie and it’s an electric neon green, you’ve been misled. Here you’ll find plenty of this tart and creamy pie that is every Floridian’s favorite dessert, hands-down! If you love turnovers, this sweet pastry is for you. You’ll find pastelitos in plenty of different flavors, even with meats. But it’s the ones with guava (or even guava and cheese) that will bring tears of joy to your eyes. Enjoy it with a café con leche and you will be a true Miamian. The iconic Cuban sandwich can be found all over the city, but it’s the little Mom and Pop type of places that do it best. The touristy places will certainly give you a great bite, but they’ll be crowded. 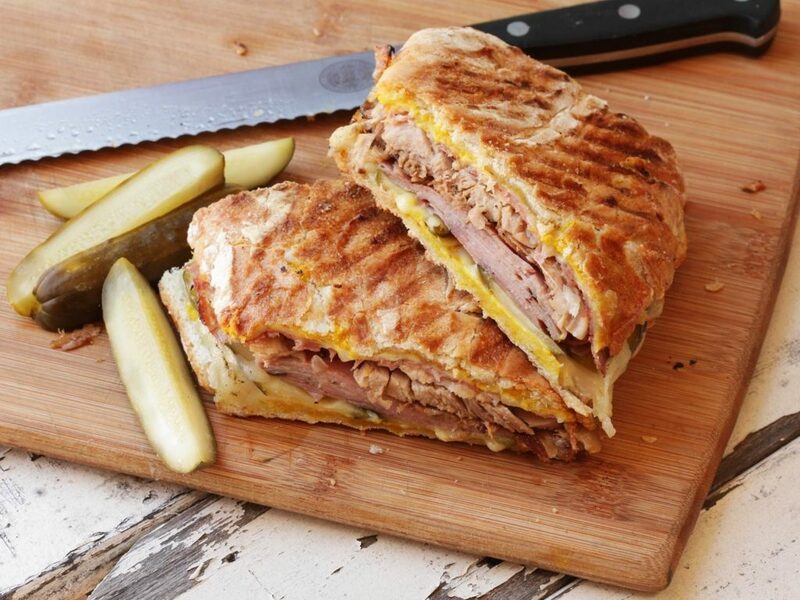 Follow the locals and you’ll get perfection in this pressed pork sandwich. Miami is the place for seafood lovers. If you’re one of them, you cannot go wrong getting a fresh fish sandwich at just about any restaurant you see. Unlike other destinations though, you have more choices of fish to choose from plus you don’t have to have it fried. Grilled or blackened are two other tasty ways to enjoy the catch of the day. Publix is a beloved supermarket in Florida which has slowly started spreading joy to other states in the south. For Miamians and every Floridian too, Publix is an institution for the best fried chicken anywhere. Subs too. The best thing you can do before heading over to the beach is stopping by and loading your cooler with fried chicken and subs from Publix for the best picnic by the ocean. While Cuban flavors are a heavy influence in Miami, Puerto Rican and African flavors come together in this popular dish of fried plantains, chicharrones (fried pork cracklings), and garlic all smashed up and molded together in a mound of pure deliciousness. It’s sweet and savory and utterly delightful. Coming to Miami soon? Which one of these will you order first?